As Master Sha sings the Divine Soul Song of Five Elements, watch, enjoy, and learn directly from Master Sha in the comfort of your own home – the easy-to-follow format with text and animated graphics will guide you through the song and the practice. 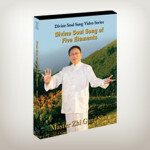 On this DVD Master Sha sings the Divine Soul Song of Five Elements in a beautiful setting high above the Pacific Ocean. Watch, enjoy, and learn directly from Master Sha in the comfort of your own home – the easy-to-follow format with text and animated graphics will guide you through the song and the practice. You may experience the power of aligning the soul, heart, mind and body for blessings for your health, relationships and finances. Use this DVD often to benefit your life fully! Includes a special Divine Soul Song Blessing from Master Sha.